It is time to Get Out Your Money and play cards with our attractive Poker Room Sign. Let 'em know whose house they are playing in. 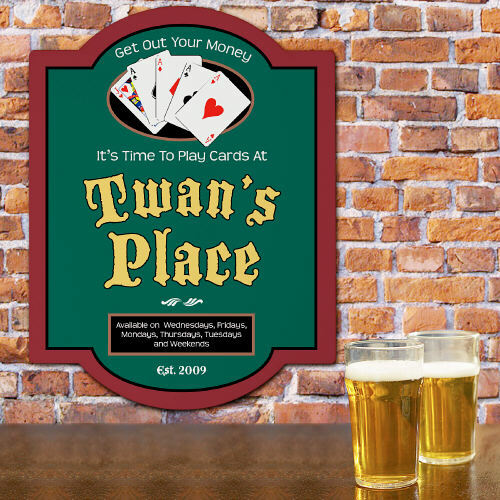 Our Personalized Poker Place Wall Sign is one of our perfect mancave gifts for a perfect Father's Day, Birthday and just because! Your Poker Room sign measures 11.5"x 15.5" and includes easy mounting accessories. Let them know your available to play cards every day of the week with our high gloss, .25" thick, tempered hardboard, poker wall sign. Your Personalized Poker Room wall sign will arrive with plastic peel and stick hangers for easy mounting. Includes FREE Personalization. 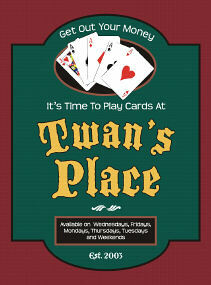 Personalize your poker place wall sign with any name and established year. 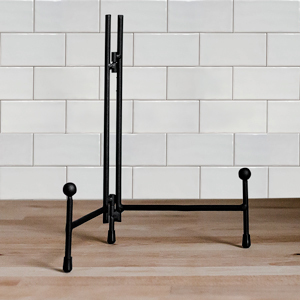 This is a nice novelty item that will personalize his space with bragging rights! Very pleased. Arrived as expected. All personalization correct. I was really happy with the finished product. I am positive the person who I am giving this to will love it! GiftsForYouNow.com has many additional Personalized Poker & Gaming Gifts for your special gift giving needs. We specialize in handsome Personalized Poker Hats, Personalized Poker Shirts plus much more.